The G.B. 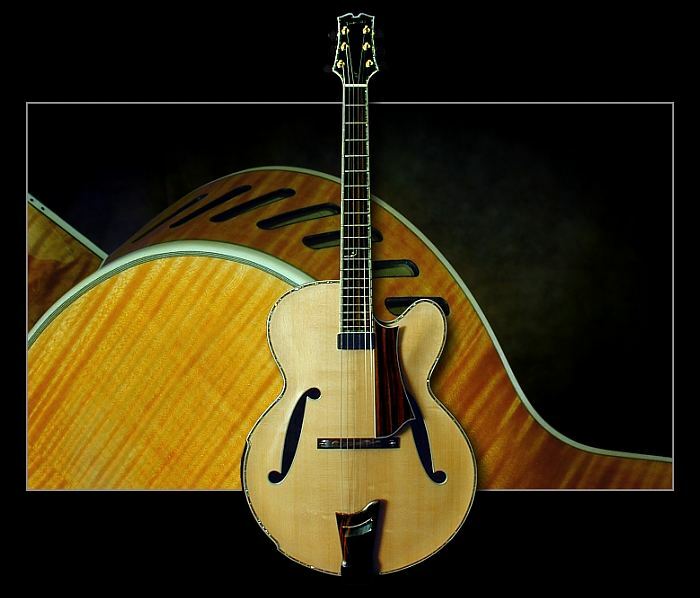 model was designed in cooperation with respected jazz guitarist Gary Benson. Gary and Doug both wanted an instrument with archtop qualities, but without the tendency to feedback at higher volume levels. This design satisfies both requirements, as well as being a very comfortable guitar to play. There are currently two versions of the basic design. Version 1 has a chambered (mostly hollow) body, with a solid section under the bridge. This offers best feedback rejection and increased sustain. Version 1 is available with or without "S" holes. Version 2 has an "X" braced top with a more open body. 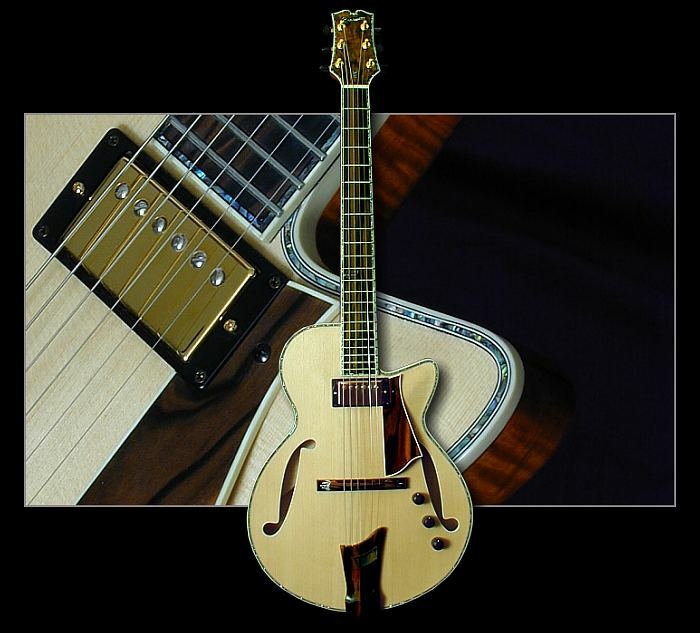 This gives more acoustic output and more closely matches the archtop sustain characteristics.Version 2 comes with "S" holes as a standard feature. Please inquire about the many options available on this model. With true hand carved top and back plates, fully hollow 16", 17" and 18" bodies (the CJ-16, CJ-17 and CJ-18 respectively), hand made exotic wood tailpieces with matching finger rest, bridge and fingerboard, as well as a wide array of custom options ... the Harrison Classic Jazz Series is the pinnacle of jazz guitar luthiery. These instruments have that classic tone that cuts through in any jazz environment ... articulate, with an exceptionally wide dynamic range, a solid note core and a very complex layer of partials. Please ask about options not listed here. 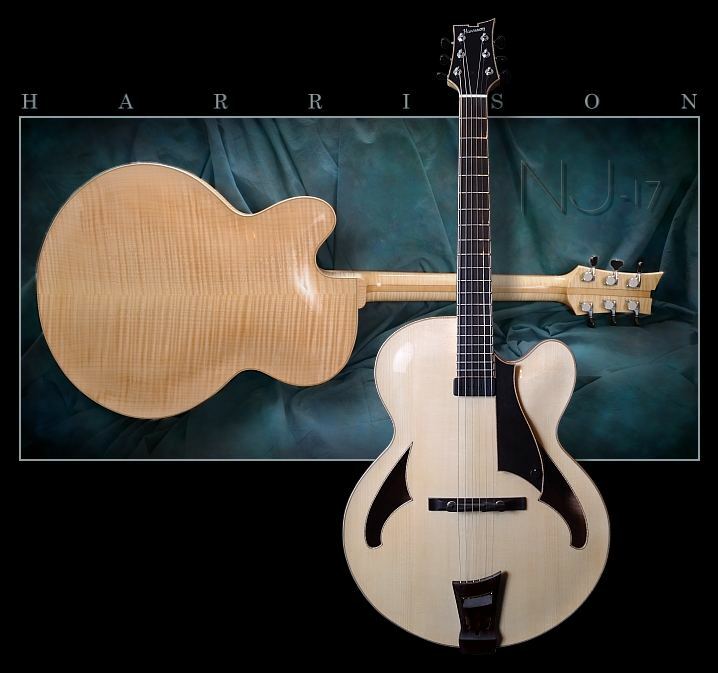 Doug Harrison has amply fulfilled his role as master luthier, exploring new dimensions of sound production through the judicious use of a multiport design on the archtop which he built for me. I say 'judicious' because I laud his choice of discreet porting, rather than an open airy and ultimately self-defeating design as other luthiers have pursued. After all, there is a huge difference in sonic production between pushing the envelope and escaping the envelope entirely, the envelope being the basic box. I knew in the first few days of ownership of my blue guitar that Doug Harrison had fulfilled my expectations of instrument design. As you may or may not realize, Doug Harrison chooses to lightly lacquer the inside of his creations. Since the lacquer was fresh, I could actually smell the results of the multiport design. The player's head is directly above the side port area. As the instrument pumps air, that air flow is translated into a pulsating mass not only directed forward from the f-holes, but upwards from the multiports. Here indeed is a simple, provable and repeatable elucidation of the laws of physics in a way entirely gratifying to the player. Completed in June 2010, the "Neo Jazz 17" (or NJ 17) was designed to include some structural and visual changes that I had been wanting to incorporate. To achieve a fuller sound from the top I moved the position of the sound holes away from the center. This allows for the central section of the top to be wider and more directly effected by the bridge vibration. To further increase fullness, the side port acts as a monitor to the player without reducing the forward sound projection. Also the pickguard is positioned so not to obstruct the treble side sound hole. Bartolini 5J pickup with pickguard mounted controls ($300). Highly flamed maple back and sides ($500). 18 inch body width ($300). Block or split block pearl fretboard markers ($400).